Restaurant chain converts payout from Canadian dollars to U.S. dollars at prevailing currency rates. Canadian restaurant chain Tim Horton's (UNKNOWN:THI.DL) declared today its regular quarterly dividend of $0.26 per share, slightly higher than the $0.2534 per share it paid back in February. The board of directors said the dividend is payable on June 7 to the holders of record at the close of business on May 23. Canadian shareholders receive their declared dividends in Canadian dollars while U.S. shareholders have their dividends converted to U.S. dollars based on prevailing exchange rates at the time of conversion. The new dividend payment annualizes to $1.04 per share and yields 1.8% based on the closing price of Tim Horton's stock on May 7. 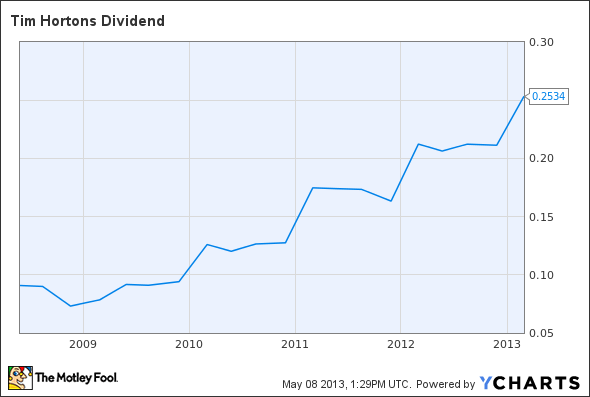 THI Dividend data by YCharts.